I told myself that I just needed my first win of the day, but really I wanted to qualify for gold. However, going into the game calmly really helped prepare me for the carnage that was coming. In Champion Select I saw that we had two “high rolers”. No one else got the joke, but we had a Role King and a Role God. I’m pretty sure it was one person playing on two computers, which is quite impressive, but Olaf had five kills (which I’m positive he stole) and only three assists, for a combined kill participation score of eight. Not only did he not carry his weight in team fights or ganking, but he took every blue. I literally only got blue from taking it from Zyra this game. First blood actually was a funny scenario. I had warded the enemy team’s wraiths at level one so I would see Fiddle coming to gank. By the time he came around to get me I had an Olaf standing the bush he was about to face check. I snuck over towards him to give him hope that he could gank us. I landed a gold card, threw my Wild Cards and Olaf used his Reckless Swing and Fiddle was gone. No chance to Flash, not chance to silence, fear, and walk away. Dead. Sadly, Olaf stole the kill, so instead of me getting double buffs, Olaf got double buffs, that he already had. Sigh. I knew that if Zyra got a hook on me that I was dead. That player only picked Zyra because she does so well against Twisted Fate. However, I was pretty sly at dodging her root, and avoided as much plant damage as possible. I didn’t mind pushing her up to her tower because, as I discussed with Czarni, I don’t need anything at the start of the game. I’ve literally been starting two wards and six health potions because I sustain mana on my own, so if I can just stay in lane topped off I will be fine. If my lane came pre-warded I may start boots, because I love the mobility of Twisted Fate. I camped bot so hard this game. I didn’t want to let Draven and Taric get ahead at all. I’m pretty sure that I used every ultimate to jump to bottom lane and cause some havoc. 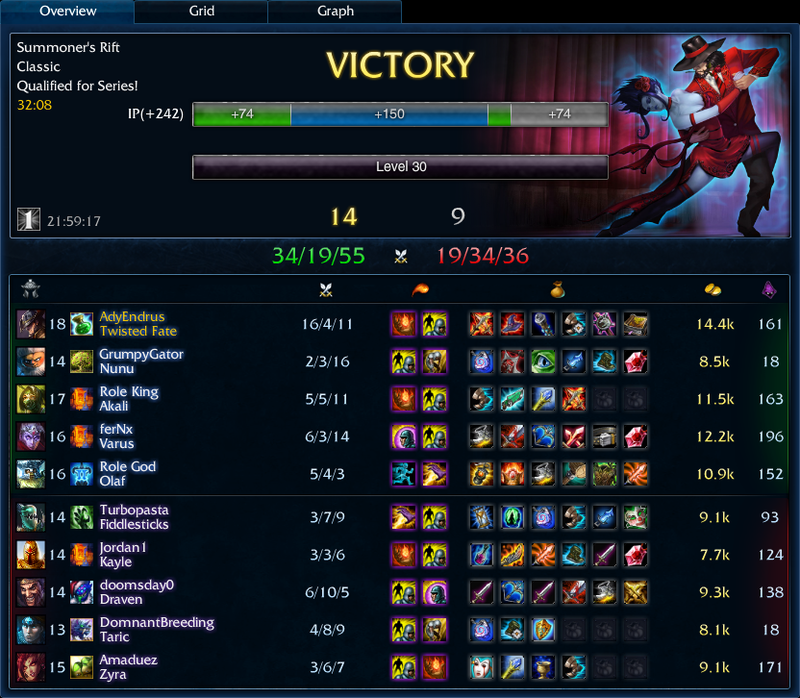 Akali was holding her own in top lane, so I just went bonkers on that poor bot lane. They hated me. Draven started raging in all-chat. It was really humorous. That is the power of Twisted Fate. His global presence really plays a step ahead of an unorganized solo queue team. My KD was pretty amazing this game, especially considering I had a kill participation score of 27! That’s 27 of my team’s 34 kills. Varus came in second place at 20, which is still more kills than the enemy team had. A small note about this game: I really noticed the power of Void Staff in this game. Normally I would go for an Hourglass after I finish my Deathcap and Lich Bane. This game I went for Void Staff and let me tell you what it did. At the end of this game I ported onto Draven where he was fleeing from a team fight. With my insane movement speed I closed the gap on him and thew a gold card. I saw where he would be after my card landed and threw my Wild Cards at him. They didn’t hit him because my gold card killed him from half health. One shot. I shocked myself, but still appreciated my team saying “lol tf”. A win is a win, but qualifying for gold is really the next step in getting out of this silver prison.